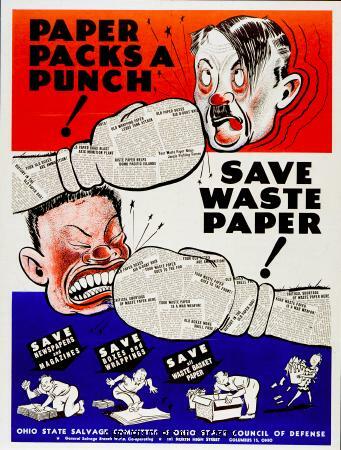 Paper Packs a Punch, poster designed by the Ohio Salvage Committee of the Ohio State Council of Defense to support the nation's salvage/recycling effort during World War II, ca. 1941-1945. Prior to U.S. involvement in World War I, the United States Congress established the Council of National Defense to manage the domestic aspects of the nation's war effort. The Ohio Branch of the Council of National Defense provided Governor James M. Cox with advice about how to mobilize the state for war. In particular, the council focused on industry and the need for an adequate supply of labor. One result of the council's efforts was the creation of the Ohio Industrial Commission, which made sure that available workers were placed in the jobs that were most needed for wartime production. In addition, the council recruited college students and other Ohioans to help on farms during planting and harvesting. Council members believed that it was important to include industrial leaders, unions, and others to contribute actively to the planning so that everyone felt invested in the process. Members of the Ohio Branch of the Council of National Defense included prominent leaders such as William Oxley Thompson, the president of The Ohio State University; Alfred Vivian, the Dean of the College of Agriculture at The Ohio State University; Clark S. Wheeler, Director of Agricultural Extension; T. J. Duffy, who chaired the Ohio Industrial Commission; Fred C. Croxton from the Ohio Institute of Public Efficiency, who was also the head of the Food Administration in Ohio during the war; and George Stauffer, secretary of the State Board of Agriculture. The council also created an influential Women's Committee, which meant that a number of women had important roles in Ohio's mobilization efforts. Mrs. George Zimmerman was the first chair of the Women's Committee. She was later succeeded by Belle Sherwin. The council established a number of committees that focused on specific aspects of the mobilization plan and incorporated key Ohioans as members. These committees included Finance, Food Conservation and Supply, Mining, Publicity, Labor and Industrial Relations, Americanization, Transportation, and County and Community Organization. The committees reflect the broad power and influence that the Ohio Branch of the Council of National Defense had during World War I.